As the 68th United Nations General Assembly came to a close last summer, it was the perfect time for me to reflect on the amazing things that had happened in the field of global health policy last year. From debates on disabilities in the post-2015 agenda to rising concerns over the Middle East respiratory syndrome coronavirus (MERS-CoV), it has been a year of unprecedented transformations in public health and marked an exciting era to be an aspiring young professional in this field. Last year, I had the privilege of attending the 66th World Health Assembly (WHA) in Geneva, Switzerland, as a student member of the coalition of NGOs working to promote the Global Non-Communicable Disease (NCD) Framework Campaign and the adoption of the Omnibus Resolution on NCDs. The resolution, which was officially adopted by Member States on May 27, 2013, encompasses major recommendations on tackling non-communicable diseases around the world and includes an action plan, monitoring framework, and a global coordinating mechanism. Specifically, the resolution set nine comprehensive global voluntary targets, including the “25 by 25” mortality reduction target. These targets, which focus on both prevention and treatment, are the final destination on the roadmap outlined in the global action plan. To ensure that these goals are met in an efficient and timely manner, a global coordinating mechanism will be set in place to unite all critical stakeholders working to deliver the action plan. It was an unprecedented personal experience to find myself sitting in the largest conference room at the World Health Organization (WHO) headquarters, surrounded by some of the most influential figures in healthcare, all brought together by a collective commitment to a burgeoning global health movement. 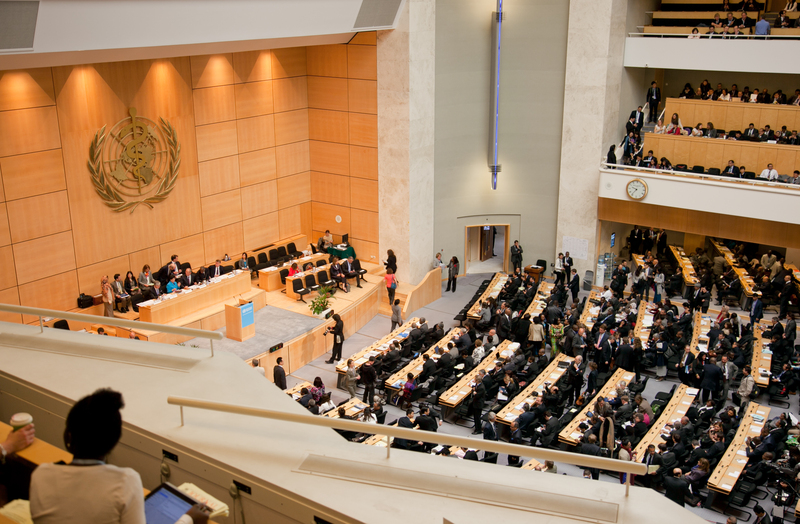 Walking into the building on the first day of WHA66 was surreal. The fact of the matter was that I was entering into the very building where world leaders had come together in years past and made history. This was the same place where Professor Viktor Zhdanov proposed the worldwide eradication of smallpox, where the Framework Convention on Tobacco Control was adopted and where the worldwide eradication of polio was reaffirmed. The extraordinary appeared to become the mundane in the high-powered world of the WHA. On an average day, I would sit and talk to the Minister of Health from Sweden, stand in line for coffee next to CEO Seth Berkley of the GAVI Alliance, share appetizers with The Lancet’s Editor-in-Chief Richard Norton at an evening side event, and ride the escalator with WHO Director-General Margaret Chan. Despite having grown up near Hollywood, I’ve never been more “star-struck” in my life. Needless to say, it’s the one time of year that all the biggest names in global health come together. While only delegates of WHO Member States were allowed to vote on resolutions, armies of representatives from NGOs, the private sector, and other health organizations were present and active. Although all the “official” business of the WHA occurs in committee meetings, it’s clear that everything that is said in these meetings is planned and premeditated. The statements and debates that take place (or occur) are simply a formality. Therefore, one is unlikely to ever see the metaphorical claws come out in this arena. The real action takes place well in advance behind closed doors. As a student, this was an ideal opportunity to observe and learn, how delegates interacted with one another and their strategies for advocating health needs of their country. Moreover, I was also able to interview representatives from different countries and different sectors – asking the agent from Johnson&Johnson about the reasons for-profit companies get involved in public health promotion efforts in the first place. If that wasn’t enough scholastic enrichment for one day, there was an endless agenda of meetings, lectures, and side events to attend. It felt like a global health playground! I spent my mornings in a committee meeting listening to delegates debate over the Omnibus Resolution for NCDs, ate my lunch while listening to a lecture on MDGs in the post-2015 development agenda, and spent my evenings rubbing elbows with delegates from around the world at cocktail hours discussing the use mHealth in developing nations. Contact your local Ministry of Health for potential opportunities through their offices.